If you are looking for some new outstanding way to improve your WordPress workflow you are in the right place. Experienced developers have found a really great plugin that will truly improve your website. They would like to share it with the WP Mayor community. 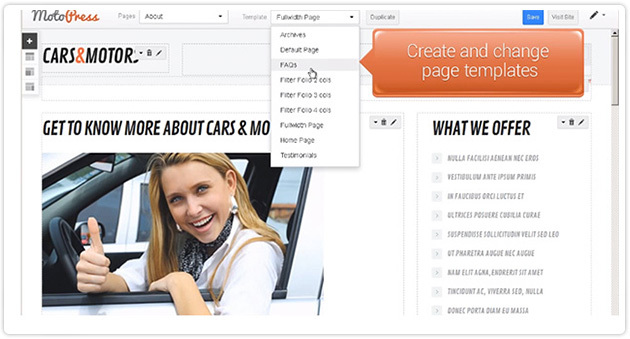 We want to present you the intuitive MotoPress plugin. This simple software component with advanced functionality is an effective way to customize the layout of your WordPress website. MotoPress extends the core features of site editing and enables to make changes without special professional skills. If you’re planning to accomplish the editing of your website’s appearance with ease – MotoPress is what you need! MotoPress layout editor has a huge bunch of useful features which will enhance your website’s functionality. The ability to add, change and even duplicate website’s pages. Users have no limitations in creation template’s pages. By using MotoPress it’s possible to add new layouts just in a few clicks. This feature is really useful when you need to append the additional page to the existing website. Only in several minutes you can create a fully new skilful website page. If you would like to change the website’s page look it’s also as easy as one two three, you can edit it by yourselves by clicking the right button. Thankfully to the core features of MotoPress website template’s pages can be even duplicated. Plugin allows you to copy the pages you need only with a single button click and save your time on learning tons of theory. Next great advantage of MotoPress is the opportunity to change the template’s structure. Just imagine, you have a website and you really like it but there are several elements on some pages that you prefer to change or remove. 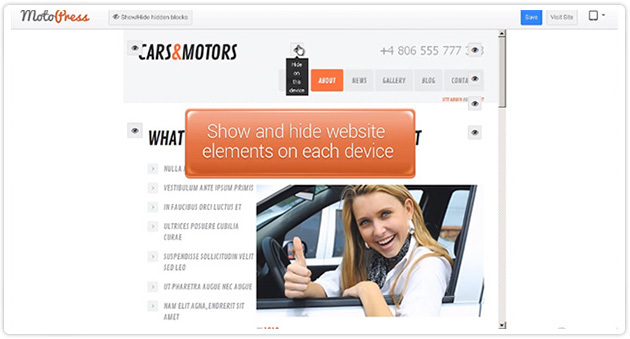 MotoPress gives you an opportunity to edit the appearance of your website template’s page. By using the plugin it’s possible to delete site’s blocks, change their location on the page and even add new website’s elements. All these changes are easy to implement even if you have never had a similar experience. One more gold feature of MotoPress is the capability to display and hide blocks on different devices. The best adjective that can fully characterise our modern world is ’quickly’ of ‘fast’. Sometimes we do not have time for breakfast and are satisfied with fast food and ‘coffee to go’. Many Internet users check out websites on mobile devices. It’s very important that this process be easy and quick. If you have MotoPress you can choose what website’s blocks to display and what of them to hide on different gadgets. You may display all layout’s elements on the notebook, hide sidebars on your tablet and leave only core blocks on the cell phone. It’s the easiest way to save time on site’s loading. What can be more convenient! We are sure, you’ll also like it. With MotoPress you can quickly edit the template’s layout and give absolutely unique and skillful look to your website. 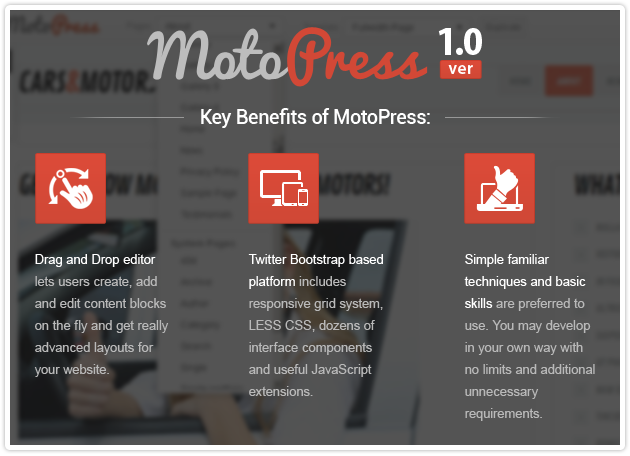 You can download MotoPress version 1.0 from official WordPress plugin directory absolutely for free. And this is not the end of good news! The next step in plugin development is MotoPress content editor which will enable to edit the content of your website. But we’ll tell you about it in the next review. To know more about updates follow MotoPress on Twitter. Emily is a passionate blogger and curious Web researcher, now working with MotoPress Team. You can follow her on Twitter or join on Facebook. Just came across this plugin yesterday when someone introduced it to me yesterday. Looking what this plugin is up to. While we already have few drag and drag frameworks, MotoPress takes a different road by developing it as a plugin. Is there any benefits of built it as a plugin? Plus, it it compatible with any theme? The main benefit of MotoPress is that the product is in development and the next version will allow users to edit deeply the content of your website. After this update MotoPress can be used with all WordPress themes you like and enables to edit not only your website’s layout but also the content. Not sure, but I think you may have a spam problem with your commenting functionality. Are these making it through Akismet? Interesting concept building this as a plugin. I just might have to try this in those instances where I’m not building something really custom. Experimentation never hurts, eh? Thanks for bringing it to my attention. BTW: add a “report this post” function or check your spam setup, Jean. The last 5 comments are pure junk. Removed spam, thanks for reporting. Previous Entry: Are YOU an Expert Freelance WordPress Developer Looking for Work? Next Entry: Squarespace vs WordPress – Which is the Best?